I know it’s been a week since the race, but wanted to get this posted, so here’s the low down. My buddy, Andrew and I got to ‘Bama on Friday morning. We decided to hit a real technical section of the trail called “Blood Rock” to pick some good lines. We had no intent in riding much or hard, just that one section. Since Blood Rock is at the top of Oak Mountain, we decided to drive the truck all the way to the top and dive into the trail close to the section instead of riding all the way up. We parked right next to another car and began unloading all of our gear necessary for the ride. When we were unpacking our bikes we met Shonny Vanlandingham, women’s pro mountain biking champ and Xterra women’s pro along with a buddy that was accompanying her for her ride. The four of us carried on small talk as we all prepped our bikes and other gear. Her and her buddy dove into the trail as we continued to get ready. Shortly thereafter, Melanie McQuaid (pro mountain biker and 3x women’s Xterra world champ) with two amateur athletes she coaches (one of them in my age group) came riding up the road. I had been exchanging email with one of them (Frank Fernandez) for a while, but I had never met him face to face. Low and behold, he recognized me and stopped to chat for a bit. Along with Melanie and Frank was Fred Smith, another excellent racer. Melanie asked us if we wanted to tag along, so we grabbed our stuff and the five of us headed down the trail. During the first pass through Blood Rock, I decided to try and knock down a rather large oak tree with my shoulder. 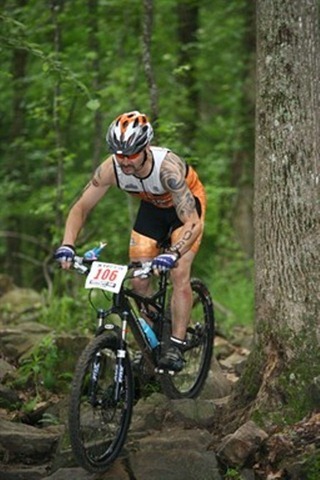 Of course, the tree didn’t move much and it sent me off course a bit, almost endo’ing on the last large drop. I jumped off the bike just as I was going over the handlebars, and used my Batman, cat-like reflexes to land on my feet safely as bike flipped several times. I have no idea how i accomplished it. Andrew and I continued down the trail and caught back up to Melanie and crew. Since it was the day before the race, I assumed they were doing a short brick session. My assumptions were confirmed after we dumped out onto the paved road the second time. 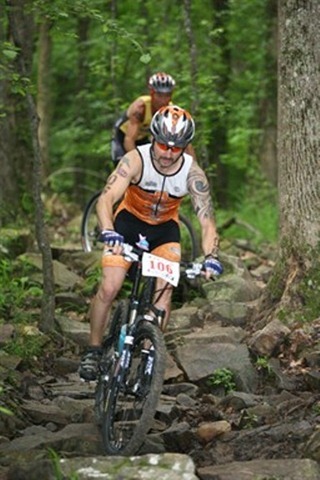 They headed back for the transition area while Andrew and I headed back up to Blood Rock. The second time we rode it I still couldn’t get thru it smoothly, so it worried me a bit. We rode back to the truck, and went to pick up our packets. We woke up race morning around 4:45 to eat some breakfast and head to transition since race start was at 7:30. It was cloudy with sprinkles on and off. The high for the day was forecasted at 75 degrees and scattered showers. I was hoping for a downpour right in the middle of the race (I love racing in the rain). During transition setup, I had my area almost complete when the guy next to me showed up. began trying to figure out how he was going to mount his bike to the rack, trying a couple of different things. During this process, he practiced it a couple of times and each time stepped over and around my stuff. I had visions of it getting all screwed up during the race. I quickly rearranged it on the other side of my bike. It kind of screwed me up as I forgot to put out a Gu Roctane to nurse on the run. I didn’t have time for any warm up. They didn’t give me any twist ties for my bike number, so I had to wait in line at the registration to get them, so any time I saved by getting my packet the day before was gone now. I had planned on swimming some, but couldn’t as I ran out of time. I hit a Gu Roctane 15 mins out. 1500 meters (two laps around a 750m triangular course with a short 50 foot beach run in between). Race started (wetsuit swim) with the pros (not wearing suits) starting 30 seconds ahead of the amateurs. 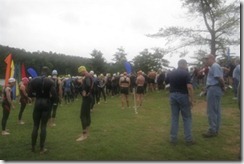 The swim start was pretty chaotic with the usual madness at the beginning. 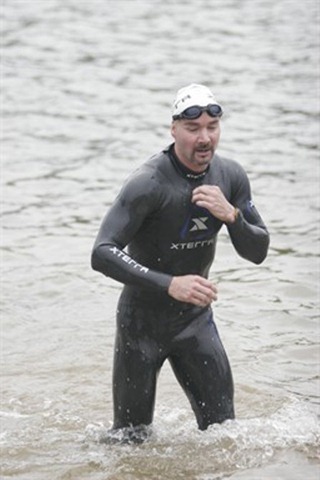 Until I rounded the first buoy, I felt tight in the suit and my shoulders were burning a bit. By the time I hit the second buoy, I was warmed up and feeling pretty good. I had trouble sighting as my goggles were fogging up towards the end of the first lap. I kept the pack of swimmers in front of me in sight and just kept going. I came out of the water after the first lap, and while running the 50 foot shore run, I pulled the goggles away from my eyes, licked each one, put them back on and dove in the water for lap two. Licking my goggles after the first lap. Lap two felt much better. Before I made it to the first buoy, while taking a breath to the left, I noticed the single digit number on the arm of pro. Three strokes later I noticed the bright pink swim cap on the head of a pro female when I breathed to the right. How cool is that? I didn’t slow down, because I knew the wetsuits were giving us an edge. 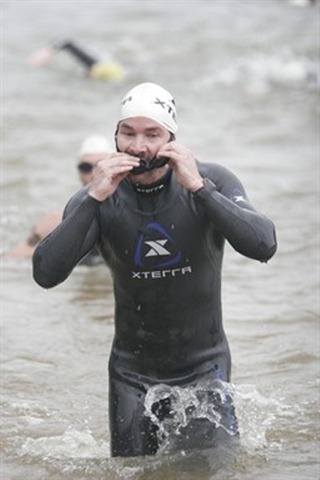 If anyone hasn’t told you by now, if you can wear a wetsuit for the race, then you should. The race day temp of the water was 71 degrees, only 1 degree off from no wetsuits. T1 went really smooth, except… I left my CamelBak. Andrew and I had debated the night before if we were going to need them on the bike leg or not. After all, it was a cloudy, 75 degree day, so there was going to be less sweating than last year. Leaving it in transition by mistake had made up my mind for me. The last minute re-arranging of my transition area had messed with my mojo. 29k mountain bike, mostly singletrack except a gravel, loose rock, fireroad climb around 3 miles long and about 700 ft elevation gain. As soon i was about 100 yards into the bike, I realized my mistake with my CamelBak. I figured the nutrition bottle plus water stops would have to suffice. The first section of the bike went well. I felt good but I conserved. I passed whenever possible, but there were several times I should have taken passes when the riders ahead of me weren’t yielding. The bike course was crowded with open race riders, sport race riders and duathlon riders. The 3-mile, 600 foot climb littered with loose rock killed me last year causing me to walk quite a bit of it. This year, I settled into a groove and climbed it nonstop. 600 feet might not sound like much in 3 miles, but this one gets really, really steep in sections and then may level off a bit for a short duration. During the climb, one of my age group competitors passed me going pretty fast. I let him go, knowing that pushing it would probably not be to my advantage. Another guy in my age group attempted to pass me, but I could tell he was overdoing it as he was breathing really, really hard. It was usually on one of the leveled-off parts. Knowing another steep section would be coming up, I let him go for a bit. Then as soon as it got steep, I would motor past him expending very little extra effort. We continued to leap frog to the summit where at the top I left him on the fast descent. At Blood Rock, I came in feeling pretty good that I conquered the hill, but nervous that I couldn’t get it smooth the day before. It consisted of 4 or 5 big drops and 40 or so spectators waiting to see a crash. I went thru the entire section as smooth as butter. As I cleared the last drop, the spectators cheered and I was grinning from ear to ear. The rest of the bike went pretty smoothly with the exception of one situation where someone had a minor crash which caused 4or 5 of us to come to a stop. I grabbed my bike and ran off the trail and around the situation allowing me to pass about three people. 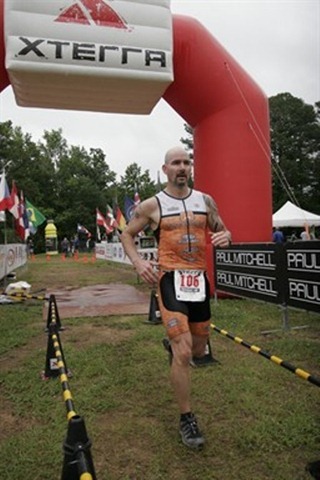 I finished off the tail end of my nutrition bottle as I approached transition. I basically took a swig from it every 15 mins while on the bike. During the bike leg, we passed two water stops that allowed me to grab water on the fly. Coming into transition, I did a rolling dismount within inches of the dismount line and ran into transition. T2 went very well. I racked the bike, ditched the helmet, changed shoes, grabbed my hat and bib and ran out of transition grabbing a water at the exit. As I mentioned earlier, I forgot a Gu to take with me. 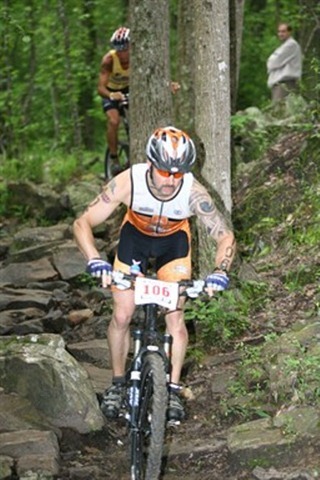 10k trail run with the first section consisting of a portion of the bike trail, then numerous steep climbs. Heading out on the run, I felt pretty good. It had started to rain a little, which I welcomed. Again, I was hoping the bottom of the sky would fall out. I carried a lot of speed into the first section of the race because I knew the hills wouldn’t be for a while. I tried to focus on just keeping a good steady pace without blowing up and making up as much time as possible before the hills. When I got to the first water stop, I grabbed a Gatorade. Yuck. Man, do I HATE Gatorade. But since I forgot my Gu, I had to take in something. Then the hills started. On the first climb I began to get a cramp in my right quad. I began to walk the rest of the hill. It subsided once I topped the hill and never came back. So I decided to run the hills to the point that I thought was either too tough to run, or that power walking would have been more efficient/faster. I barreled down on the downhills and made time I lost on the climbs. At one point someone passed me from my age group on a hill, and I caught him on the downhill. We continued the same cycle for the next hill. Once I caught up to him, we exchanged pleasantries and introduced ourselves. I asked if he had ever raced this course before, and he said he hadn’t. So when he took off on the next climb, I let him go thinking he’d burn himself out on the next 4 hills. I never caught back up. Guess it wasn’t the best strategy for me to take. By the way, he finished just ahead of me. We both passed another guy from our age group during our game of cat and mouse. 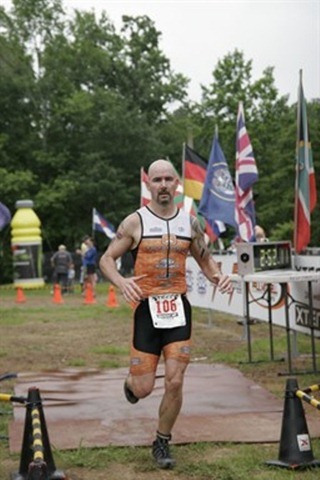 Once I hit the road, I poured on what I had left down the road and around the last section of lake before the finish. Last year I finished 93rd OA and 12th in my AG. This year, 51st OA and 7th AG, so a definite improvement. I was 15 minutes away from a 3rd place finish and qualification for Worlds. I still have work to do.